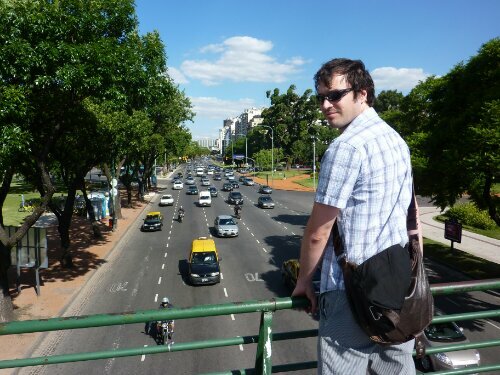 Buenos Aires is a great city with plenty to do, see and experience. We felt we learnt a lot in the 12 days we spent there but I am sure we just scratched the surface and there was plenty more to discover. We have already written about some of the great places we visited in Buenos Aires but there were a few things it would have been helpful to know ahead of time and we have tried to capture them here. Of course this is just from our experiences and nothing beats a good dose of common sense in any situation. Please feel free to comment with your own experiences. 1. Don’t be limited by the guidebook – there are plenty of hotels in San Telmo – the hotels are initially hard to spot and often just have a doorway at street level but many have a banner above. You can easily find a dozen just by walking a few blocks. We spent a few nights in a nice budget (315 pesos per night) but very clean hotel called Ayres Porteños Tango Suite, not ideal if you are looking to meet lots of people but a nice quiet haven for us with good aircon. 2. It is really easy to rent an apartment and worth considering if you are staying for a week or more – apartments can be a lot cheaper than staying in a hotel and many people take them for weeks or months while they stay in the city. We found ours quite by chance at Casa San Telmo and were able to get a good deal because they had a week free between rentals. Our apartment was adequate but a bit run down and noisy because it was on the street. Look for a place set back from the street, particularly in San Telmo. We really did enjoy the space and the cost saving. We did not look around a lot but we heard of others finding nice apartments through Air BnB. We paid about 300 USD for a week, 1000 USD for a month seemed a good benchmark. However, we also heard of much cheaper long term rentals with local shared apartments through Craig’s List and Couch Surfing. 3. Paying in US Dollars can save a lot of money – unfortunately confidence in the pesos is diminishing and many Argentinians are keeping there savings in dollars. The black market exchange rate we were told for dollars at the time of writing (Feb 2013) was about 7.5. With only 7.9 pesos to the pound when taken from a cash machine this leads to significant savings when paying in dollars. Many hotels will give a much cheaper price when payment is in dollars and our rental apartment and Spanish course also wanted payment in dollars. Top tip – we were told that dollars can be taken from cash machines in Uruguay so a short boat trip to Colonia may well pay for itself with the money you can save. 4. Yellow taxis are cheap but make sure you know the intersection and carry small money – taxis on the street get some bad press in the guide books but we found they were fine. Look out for the red ‘Libre’ (free) sign in the front window. No doubt there are taxi drivers who will try and rip you off but some good advice we had was to make sure you know the intersection before you get in the taxi – many streets are miles long. Also avoid paying with big notes as there seem to be many scams reported where fake notes are exchanged or incorrect change is given. Apart from that taxis are cheap and comfortable, we never paid more than about 35 pesos travellng between San Temo and the main parts of the city. 5. Buses are an excellent way to get around but you need small change – the bus network is incredible in BA and seems to be the locals choice. Buses only accept coins which are suprisingly hard to come buy. You can get them in the bank by asking for change – “Tienes cambio por favor?” You get on the bus and first tell the driver where you are going, he will tell you the price and you put your money into the machine behind the driver which dispenses your ticket. BA has a grid street system so it is quite easy to follow where you are. There is a great little book which shows all the bus routes, ask around for it or look on the magazine stands. We also recommend getting the local bus from the International Airport – it is bus number 8 and you can get it in front of the domestic terminal B (just over the road from the entrance). It is very cheap (5.50 pesos for each of us) but it does take quite a long time (2 hours) to get to the centre. You can get change at the bank in the international terminal or outside the domestic – we queued for about 10 minutes for this. The buses came every 15 or 20 minutes. 6. 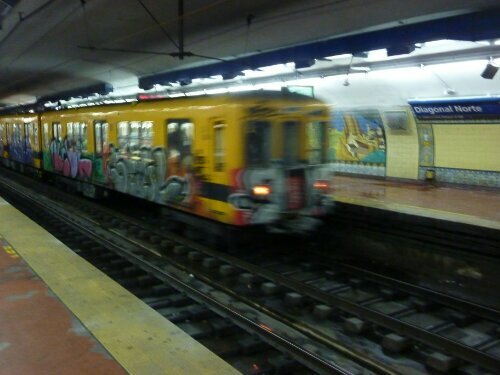 Be careful of petty crime, especially on the subway (Subte) – in general we felt very safe walking around the city and San Telmo at all times of day and night. BA is a busy place and there are usually people around. People don’t really start going out for dinner until 10pm. The main annoyances we were aware of were petty and opportunistic thefts. The subway was particularly bad because it gets quite crowded – I even caught someone trying to pick pocket me. In general don’t keep stuff in your pockets and if you are carrying valuables keep them in a closed bag in front of you at all times. A friend of ours had her bag cut open on a busy subway (she didn’t notice until later) so be vigilant. Do not let this put you off doing anything – just be careful with your belongings. Definitely do not be afraid to take the Subte as it is a convenient way to get around – you can buy single tickets for just 2.5 pesos (a single ticket or trip is called ‘un viaje‘). It is much more pleasant outside of busy commuter times. Chris are you naked in that picture? I love reading your impressions, Chris! Makes me wnat to go there. Enjoying your blog. Keep the updates coming. Just think, you can do the same through Botswana and Angola in July! Lol.